When Jon Huntsman railed against Rick Perry for his stance on global warming, their wives never broached the subject in conversations befitting the friendship - a sort of “wives club” – they have cultivated on the campaign trail. Letting it be has become a mantra for Huntsman, Anita Perry and Callista Gingrich, who have bonded amid the heated GOP presidential campaign and animosity that’s part and parcel of high-stakes political battles like this one. The women, they agree, are too busy focusing on motherhood and each other’s well-being to let their husbands’ jousting get in the way. Perry and Huntsman first met when their husbands served as the governors of Texas and Utah, respectively, but the two women reconnected in the spring when the Huntsman family returned to the United States after Jon Huntsman served as ambassador to China for two years. The Huntsman couple dined with Anita and Rick Perry in Austin, Texas, prior to both of the candidates’ entrance into the race, and by the end of the meal, the wives had exchanged email addresses with each other. “She’s somebody that whether our husbands had served together or not, if I had met her on the streets, we’d be friends,” Mary Kaye Huntsman said. While they see each other at debates and other major political events, the two keep in contact with each other via email, sending each other quick missives several times a week. Perry and Huntsman’s conversations stick strictly to friendly topics, checking in on when they’ll see each other again and how their families are handling the campaign. The two first ladies are bound together by a number of common characteristics. They both began dating their husbands while in high school and have been by their sides through their political careers. Issues of health are of great importance to both women as Perry worked as a nurse prior to becoming the first lady of Texas and Huntsman and her daughter, Liddy, started a program for juvenile diabetes patients in Salt Lake City. But the role Perry, a mother of two, and Huntsman, a mother of seven, both cherish the most is caring and protecting their children, especially as they endure the animosity of a campaign cycle. 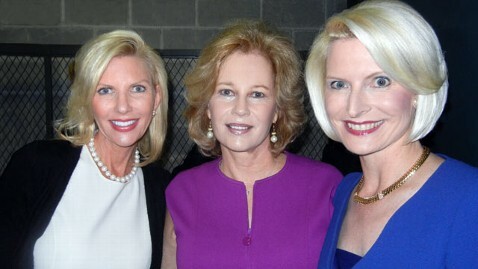 Each of the women has met most of the candidate’s spouses – save Herman Cain’s wife, Gloria – through the debates and other major political events, but among the group of spouses, they have both formed an additional friendship with Callista Gingrich, wife of the former House speaker. Gingrich, 45, first met Anita Perry at Gov. Rick Perry’s first debate in Simi Valley, Calif., in September, but her relationship with the Huntsman family dates back to 2009 ,when Newt and Callista Gingrich visited then-Ambassador Huntsman and his family at their residence in Beijing, China. Gingrich, who released her first children’s book, “Sweet Land of Liberty,” in September, has sent copies of her book to each of the candidates to share with their children and grandchildren. “Both Anita and Mary Kaye have kindly shown interest in my new children’s book, ‘Sweet Land of Liberty,’ featuring Ellis the Elephant. As I launched the book in September, both would ask about how it was doing. Each liked the idea of a patriotic elephant sharing our nation’s history with children,” Gingrich said. The three women are set to speak at the Women Working for Change conference in Washington, D.C. later this month. And while Gingrich maintains a connection with Huntsman and Perry, she also shares some hometown roots with Rep. Michele Bachmann’s husband, Marcus. The two Wisconsin natives first met at a fundraiser Newt Gingrich hosted for Bachmann in Minneapolis and realized they lived just miles apart as children. For Gingrich, Huntsman and Perry, life on the campaign trail has extended beyond merely supporting their husbands and children, forming a rare network of support for each other as they experience the trials of campaign life. Said Perry: “I don’t know how people survive without their friends and family in any situation, and when you have this running for this office, it brings your friends and family even closer.